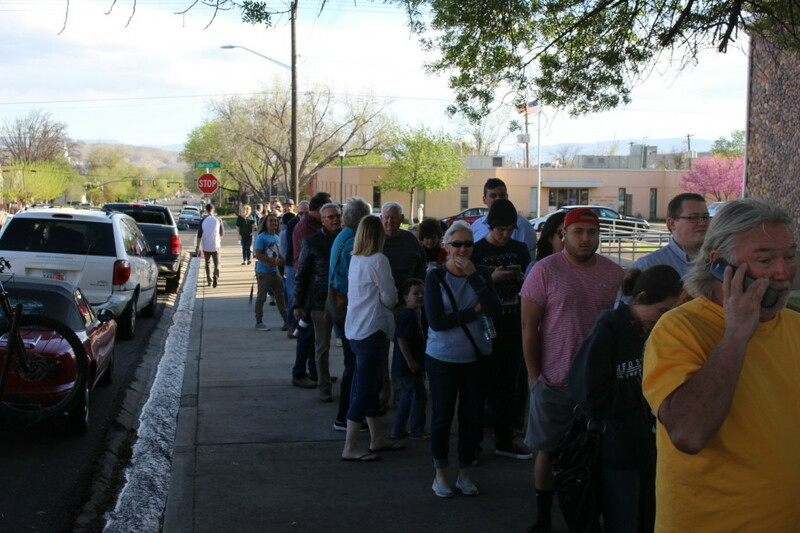 SOUTHERN UTAH – Republicans and Democrats in Iron and Washington counties turned out in force Tuesday night, surprising and delighting members of both parties. 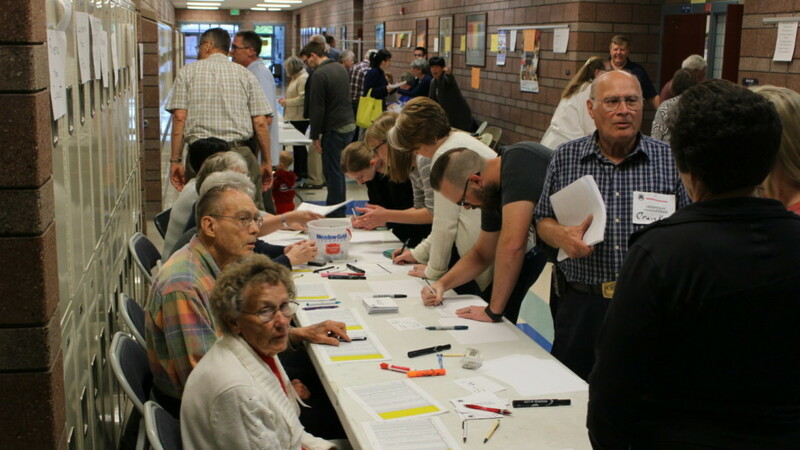 The response was so high in Iron County that organizers ran out of regular ballots and had to start using provisional ones while making additional copies, Loosely said. “The numbers were just huge,” he said. In St. George, Ron Hansen, who helped caucus attendees find their respective precincts at Dixie High School, said the turnout there was large as well. At least 800-plus county Republicans showed up at the high school and packed into classrooms where, in many cases, there was standing room only. 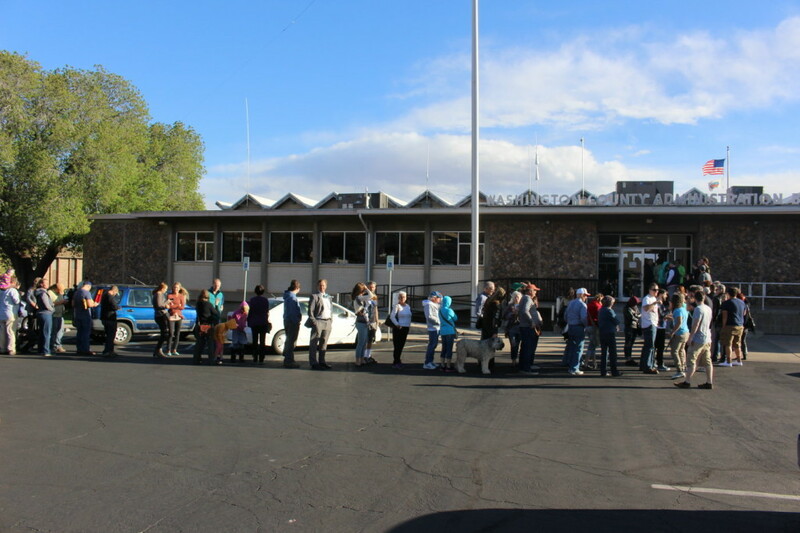 Other caucuses were held at precincts across the county. “Yeah, it’s big,” Hansen said. Hansen attributed the high participation numbers to people feeling upset over the state of the nation. “They don’t like the direction the country is going,” he said, adding that preference for the three Republican presidential candidates – Donald Trump, Ted Cruz and John Kasich – seemed fairly split among party members. Officials from both parties expected caucus numbers to be high because it is a presidential election year. 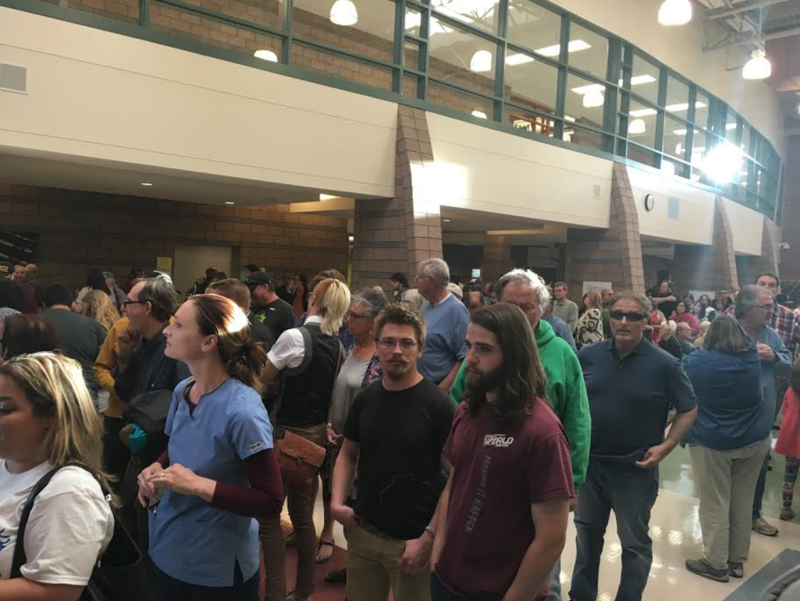 Attendance was phenomenal Tuesday, party officials said, because members were able to vote their preference for president which would help determine which candidate would win Utah’s delegates. The Washington County Republican turnout to the caucus was incredible, party vice chair Mary Burkett said. 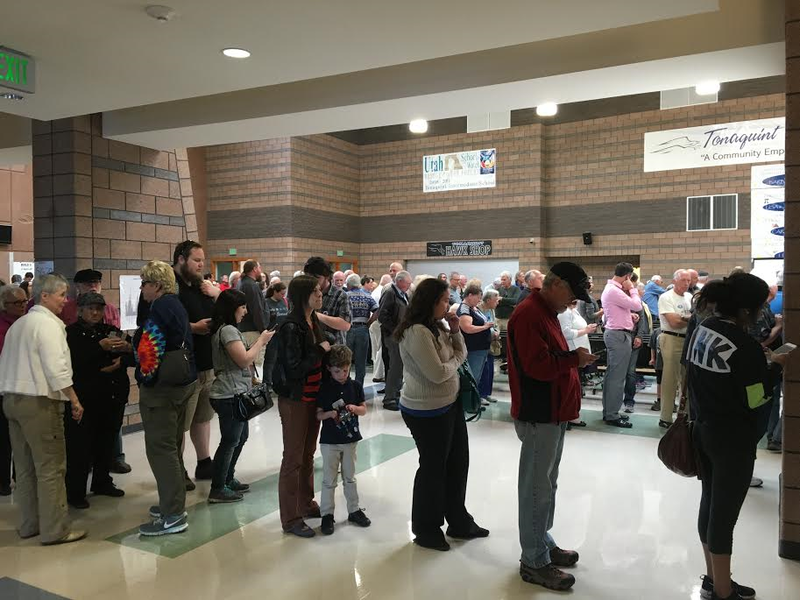 Utah Republican Party officials estimate that as many as 200,000 party members participated in the caucus statewide. Among those, 30,000 registered to vote online. 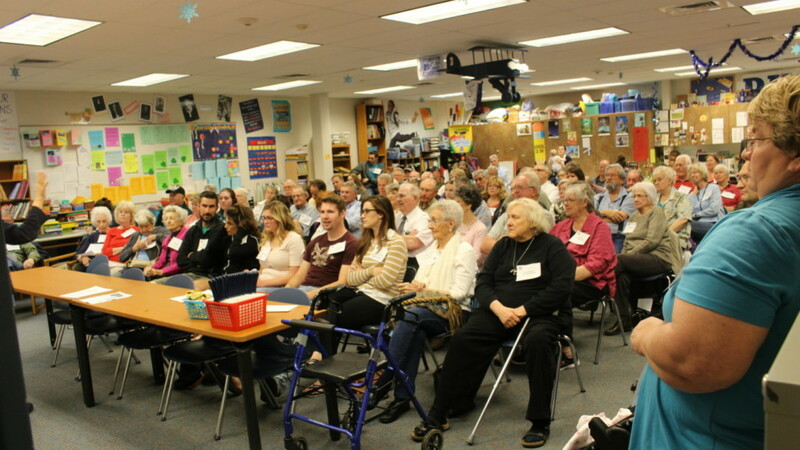 While the Republicans packed Dixie High School locations, Washington County Democrats packed into the Tonaquint Intermediate School and Washington County Administration Building, as well as two other locations that overflowed with caucus attendees. 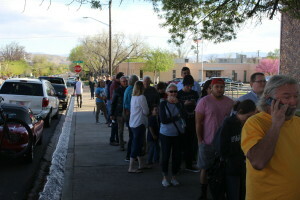 At the Washington County Administration Building, the line to get in was around the block at one point, Almaguer said. It is also the first year that the Washington County Democrats have filled their delegate count – 89 in all – for the upcoming state convention. Almaguer said they usually have half that amount. Statewide, attendance at the caucus has been immense. Some precincts shared the same fate as the Iron County Democrats, running out of ballots and then printing out new ones to use as an alternative. As far as presidential delegates go in Utah, the Republicans have 40 delegates while the Democrats have 37. Delegates for Republican candidates will be divvied out proportionally according to the percentage of votes cast. However, if one candidate gets over 50 percent, it’s winner-take-all. Democratic candidates are awarded the number of delegates based on the percentage of votes they get. As the county parties across the state counted ballot results late into the night, major news outlets like CNN and the Associated Press projected Democratic presidential candidate Bernie Sanders as the winner with around 74 percent of the vote compared to Hillary Clinton at 25 percent. He also won in Idaho, while Clinton took Arizona. 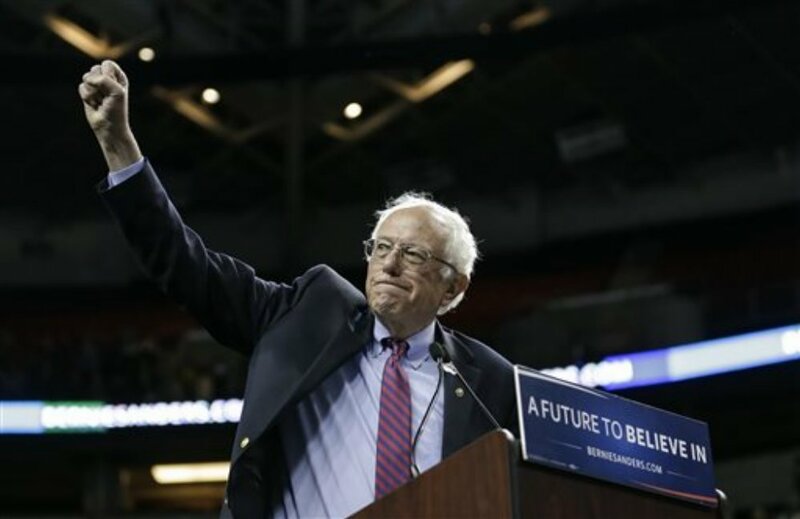 In Washington County, Sanders garnered 1,509 votes in the Democratic caucus to Clinton’s 660. In Iron County, Sanders led Clinton 639 to 142. Ballot results for the Washington and Iron County Republican caucuses were not available by 2 a.m. Wednesday. As the night wore on, major media outlets declared Cruz the winner with 70 percent of the vote in Utah, Kasich a distant second at around 16 percent and Trump close behind at 14 percent by 2 a.m. Wednesday. 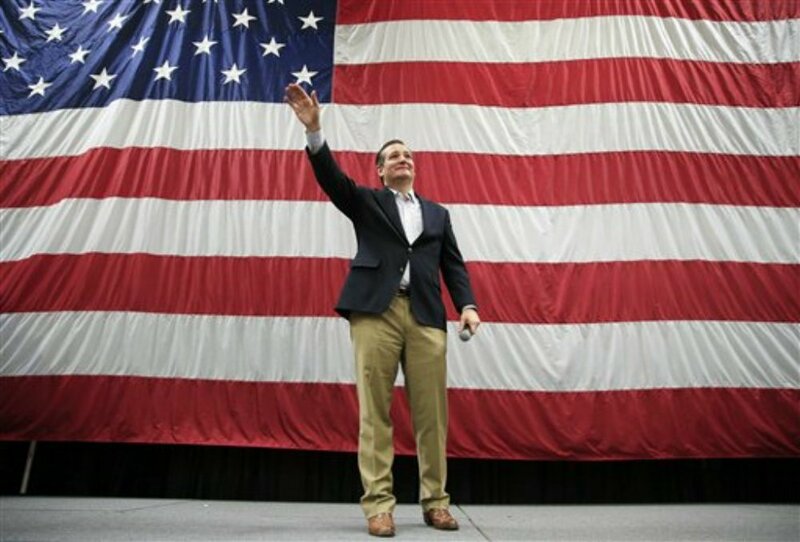 By maintaining a lead of over 50 percent, Cruz gains all of Utah’s 40 Republican presidential delegates. Trump won Arizona while Cruz claimed Idaho. Needed to win the nomination: 1,237. 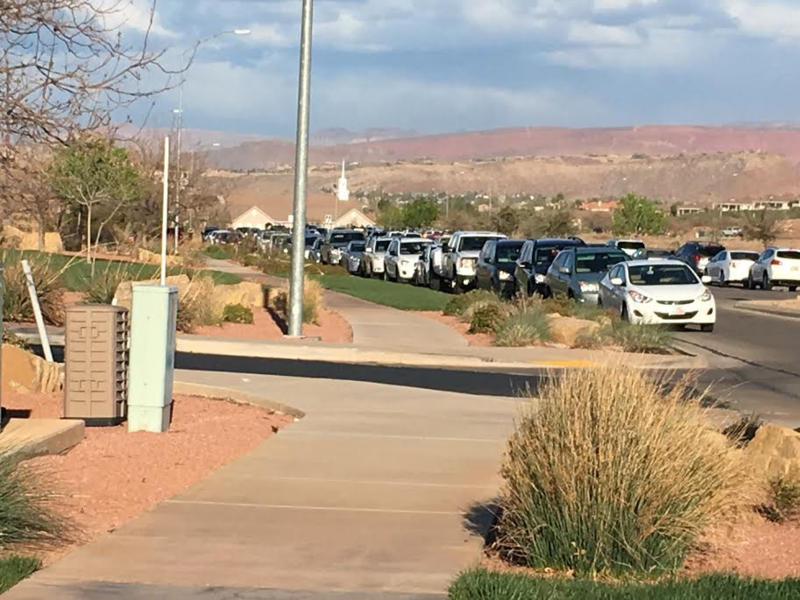 St. George News reporter Ric Wayman contributed to this article. Well, the votes are being counted. Seems ridiculous to me that they didn’t stay and get them all counted last night. Washington County is only 60% done with the counting, at least as reported so far on AP’s website. And in this year when supposedly so many people care and supposedly we had three times the normal number of caucus participants, we still only had about 14% of the state’s adult population exercising their right to vote. Only 17% in Washington County. That’s pretty shameful. You will get what you deserve when you don’t study the candidates and make a wise choice. Oh, and how disappointed I am that it looks like 4,000 people in my county (26% of those who took the time to vote) voted for the childish, self-centered, ill informed Donald Trump, who would not be able to accomplish what he so brashly promises. Thank goodness most Utahans won’t accept that kind of person. Cruz won all of Utah’s delegates with a 55% lead over Trump. Too bad Kasich didn’t get some of those. These numbers are estimated, extrapolated from the percent of results reported so far. PLEASE DO BETTER IN NOVEMBER!! Thanks Steve, that’s a great analysis. I too found it interesting that 77% of our fellow county citizens in the Dem caucus voted for the socialist. I suppose the mask has been dropped now, and we can now get started moving past that whole “secure the blessings of liberty” silliness. Unfortunately, the comment form of St. George News messed up the link I tried to helpfully include. SteveSGU, good observations regarding voter turnout. However, your observations about the candidates was primarily a regurgitation of tired cliches. Applying critical thinking and not applying logical fallacies will enable you to make more informed choices.